It looks like 2013 will be a pivotal year in which content marketing is a “must” strategy for pet and veterinary companies, whether you’re marketing pet products or your business is a pet or veterinary industry supplier. 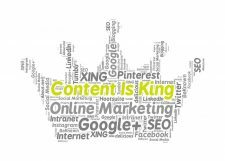 According to B2B Content Marketing: 2013 Benchmarks, Budgets and Trends,* which surveyed more than 1,400 North American business-to-business service and supply companies of various sizes and industries, marketers are counting on content marketing to help them achieve their major business goals. They’re recognizing that a competitive marketing strategy must include a steady stream of highly useful content to boost brand awareness, customer acquisitions, lead generation, customer retention, loyalty, competitive positioning and more… while also increasing website traffic. 91% of the surveyed marketers use content marketing. Wow, 9 out of 10 of these marketers consider content as a primary marketing strategy. 54% of these companies will increase spending on content marketing over the next 12 months. Perhaps this group includes your competition, so you’ll want to give it a serious look. The survey respondents reported that they use an average of 12 content marketing tactics. This includes traditional marketing tools as well as online tools, as you’ll see below. If you’re preparing a content marketing plan for your pet business in 2013, what’s the best type of content to include? And of course, you’ll want to make SEO (search engine optimization) a major part of the equation to make sure these efforts drive the most traffic to your core website (and your bricks and mortar location, if you have one). Otherwise, all that content won’t reach the largest potential audience who is searching for your products or solutions. What’s your pet business marketing plan for 2013? Does it include a strategic flow of useful and unique content? Here’s to a prosperous pet business! PreviousPrevious post:Get More Customers to Stroll Over to Your Pet WebsiteNextNext post:Does Your Pet Website Pass This First Impression Test? Is Veterinary Telemedicine the Way of the Future?